The purl stitch is just as important as the knit stitch - you can't do one without the other. I know a lot of beginning knitters who get confused and frustrated when it comes to purl stitches - I actually learned how to purl before the knit, and I find it just as easy. 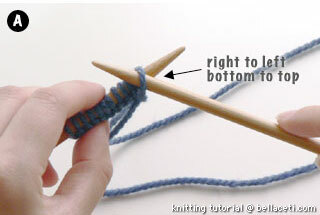 Here are the step-by-step instructions on how to make a purl stitch, English style. You'll get the hang of it with a few tries. First, take your nicely cast-on work in your left hand and pick up the ball-end yarn with your right hand. 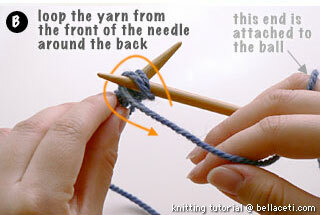 Then take the right-hand needle and slip it into the first loop, right to left, bottom to top (Figure A). Then take the yarn in your right hand, and loop it around the right needle counterclockwise from back to front (Figure B). Make sure the yarn is in front of the needle and not behind it. You might want to hold the right needle in place with your left thumb so the needle doesn't slip out. Here's the most tricky part: using the right needle, carefully lift the new loop into the first loop, under the left-hand needle (Figure C). 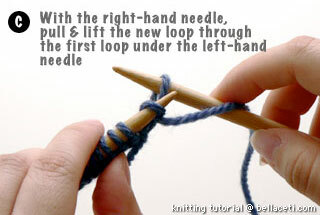 Slip the first loop off the left needle, and there! 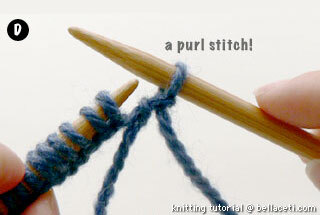 You have just made a purl stitch. Repeat until you have finished the row. You'll see that all the stitches have a loop right under them, almost like they're wearing little pearl necklaces. 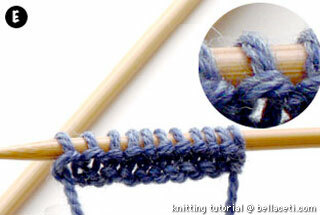 Flip your work and start again - now you know how to purl!